Microvision has announced that they will be showing their ultra-thin mobile laser projector prototype at the CTIA Wireless 2008. 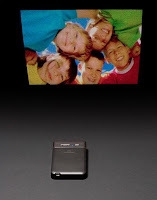 The SHOW Pico Projector Prototype is a hand-held, battery operated laser pico projector and will enable large screen viewing from your cell phones, laptops, digital cameras, PMPs, and other mobile devices. This device would prove especially useful for older persons who have a hard time squinting at their cell phones (dad, are you reading this?). The SHOW Pico Projector prototype has a WVGA 848 x 480 resolution, 10 lumens brightness, 16:9 native aspect ration, and 60Hz refresh rate. Video inputs include RGB, Composite, and S-Video. 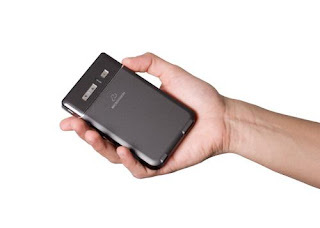 The device weighs 220 grams and has a rated 1.5 hour battery life. Let’s hope this one gets out of being a prototype and into a production.